Welcome to our Hotel Resort and Restaurant located in Dauis, Panglao Island, Bohol, with 14 hotel rooms and apartments. Near to Tagbilaran, the white beaches of Panglao Island and all other attractions of Bohol. Please Click on the photo to start the slideshow. This small resort or you may call it also boutique hotel, located in Dauis, Panglao Island, Bohol, between the island´s capital Tagbilaran City and the white sand beaches of Panglao, is the right place for you to relax and to explore the beauty of Bohol and Panglao Island. With it´s only 8 hotel rooms and 6 apartments you will enjoy in our resort a private, almost family like atmosphere, because providing excellent service and friendliness to make your stay in our resort enjoyable is not the job of our staff. - It is it´s concentrated passion! Most of the time our place provides an enjoyable climate because of the elevation of 140 meters above sea level, mostly with a nice breeze and almost no mosquitoes compared to lower locations. 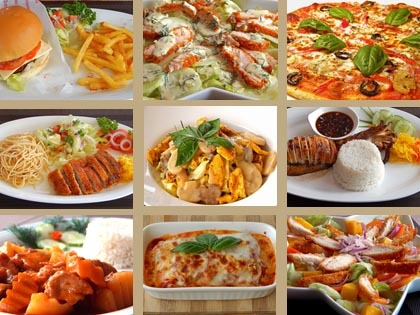 It is near to Tagbilaran (5 km) and also to the white beaches of Panglao Island (15 min drive). Simply good food, served with a smile and great view. 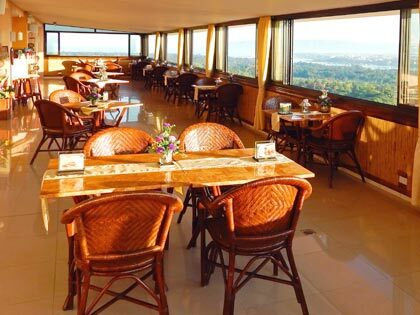 Le Panorama Restaurant is a great venue for your next event! 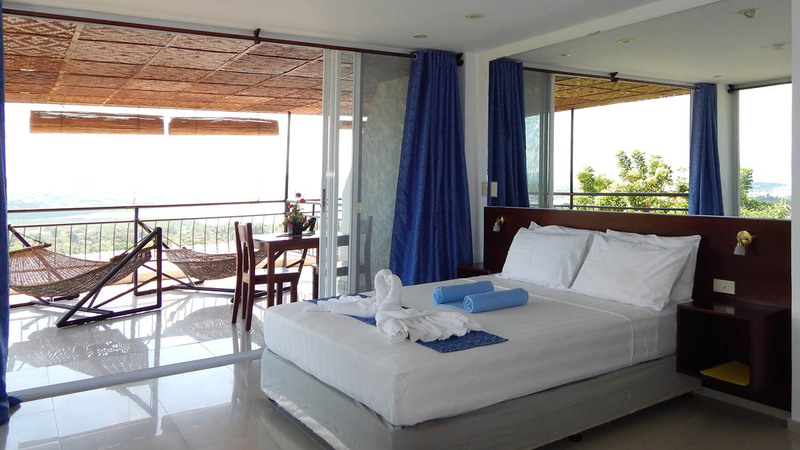 Comfortable and very well equipped hotel rooms (Superior Room and Deluxe Room) and apartments (Deluxe Apartment and XXL Deluxe Apartment) at a gorgeous location on Panglao Island, all with roofed terraces and a fantastic view are the basis for a great vacation in Bohol. While the hotel rooms are good for a shorter stay, the apartments are well equipped to accommodate guests also for a longer stay of weeks or months. For longterm rental please contact us to get a special rate. It depends upon the length of your stay and the season. Hotel Room incl. breakfast, free Internet access, complimentary coffee, tea, water and welcome drink. 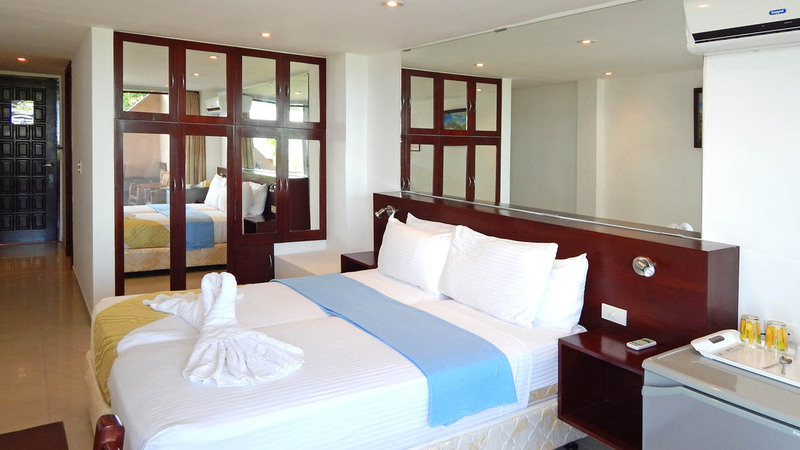 The superior rooms are a little bit smaller then the Deluxe Rooms, but offer the same comfort. 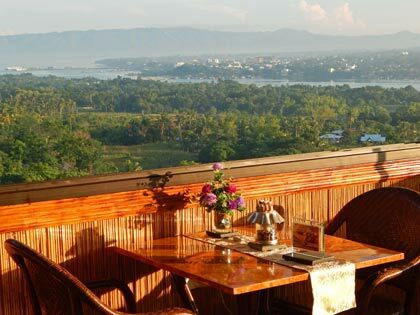 The terraces offer either a view to Tagbilaran and the western part of Bohol or to the Mindanao Sea and Bohol´s South coast. 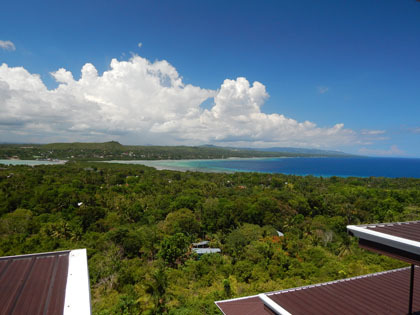 Hotel Room with large roofed terrace facing the panorama view over Bohol incl. breakfast, free Internet access, complimentary coffee, tea, water and welcome drink. 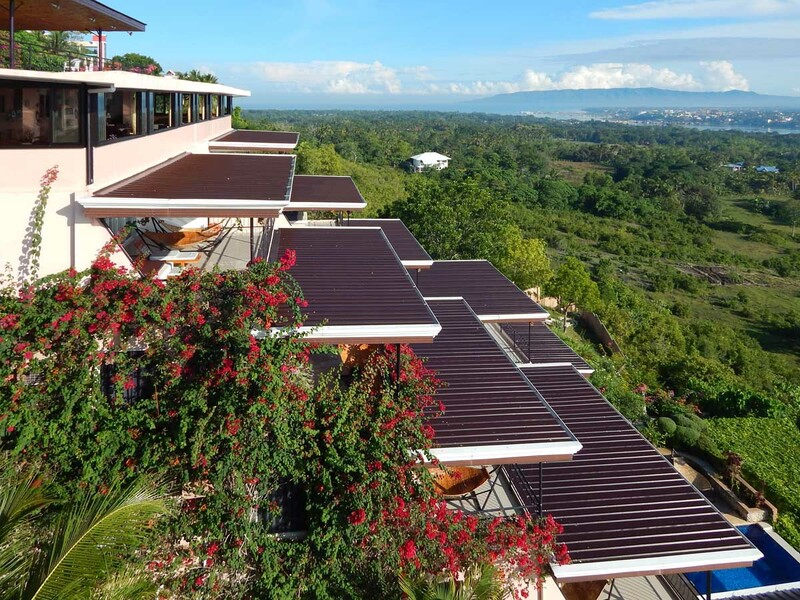 The Deluxe Apartment in studio type is located beside the pool terrace, has it´s own big roofed terrace facing the panoramic view over Bohol and the hotel garden. 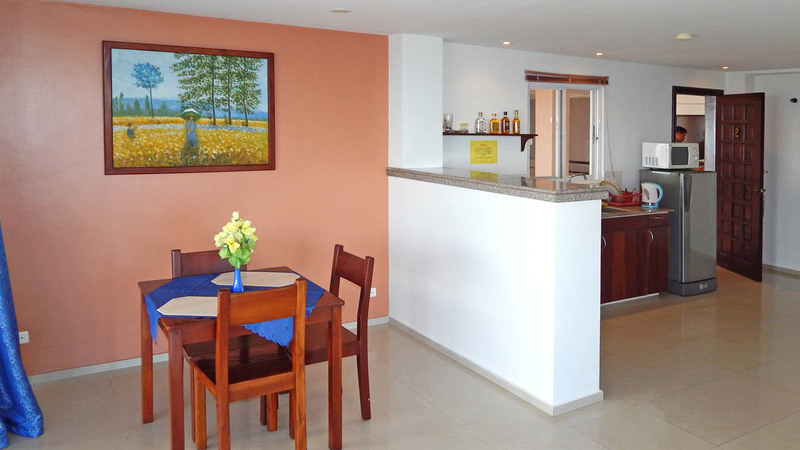 It has also a well equipped kitchenette and offers enough space for a longer stay. The rate is incl. breakfast, free Internet access, complimentary coffee, tea, water and welcome drink. Very spacious Apartment (around 90 sqm with terrace) in studio type or with a separate bedroom, with large roofed terrace facing the panorama view over Bohol incl. breakfast, free Internet access, complimentary coffee, tea, water and welcome drink. 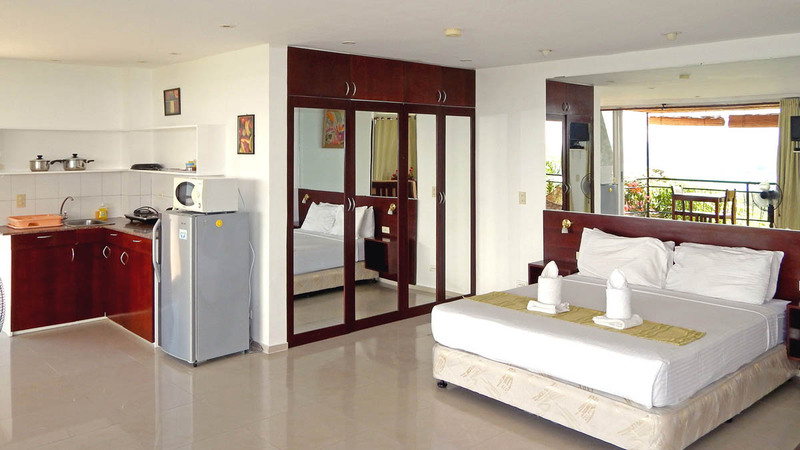 Here you get a quick overview over room rates, terms and conditions. Bohol is the tenth largest island of the Philippines with a land area of 4,117 square kilometres and a coastline of 261 kilometres. The climate of Bohol is generally dry, with maximum rainfall from June until October. The interior of Bohol is cooler than the coast. With it´s attractions, the white sandy beaches, the world famous Chocolate Hills, the Tarsiers, it´s diving spots and a wide selection of hotels and resorts, the province of Bohol is a very popular tourist destination in the Philippines for visitors from all around the world. The most of the hotels and resorts are located on Panglao Island, near to the popular dive sites, the most of Bohol´s tourist attractions and Tagbilaran City with it´s infrastructure (shopping malls, seaport and airport). For more traveller information about Bohol please click here.